In his dystopian novel, The Day of the Triffids, British writer John Wyndham describes a world overrun by mobile, carnivorous plants—the triffids—biologically engineered for their rich vegetable oil. Farmed and controlled, the plants prove economically valuable. But when a strange meteor shower drives much of the world’s human population blind, the triffids begin to gain ground, attacking people, threatening human survival itself. The triffids could serve as a metaphor today for the tropical oil palm Elaeis guineensis. Oil palm is remarkable for its high palm oil yield, its profitability, and its mobility—read expanding cultivation in vast monoculture plantations in tropical forests worldwide. Many studies attest that biological diversity declines when oil palm monocultures replace forests (thus ‘eating up wild spaces and species’). 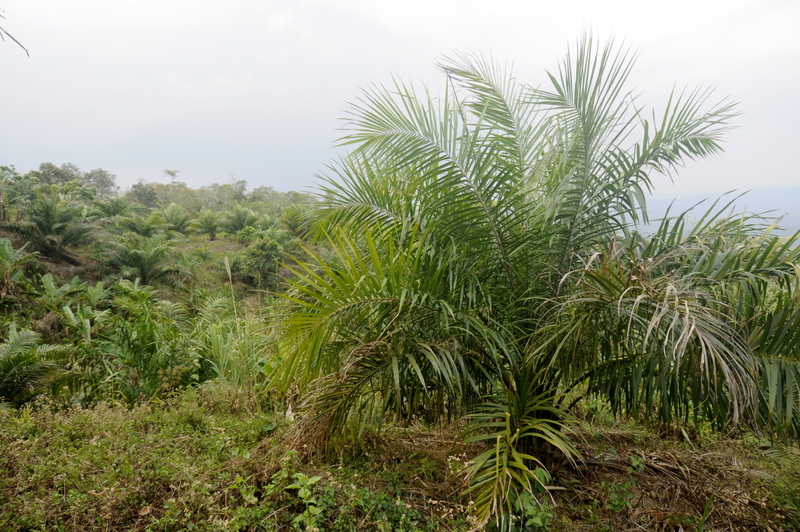 According to FAO figures, oil palm now occupies over 14 million hectares worldwide. Consumer pressure in the developed world has triggered calls for sustainable palm oil production, but the reality in the tropics is that oil palm cultivation continues to expand rapidly, particularly in South-East Asia. India, too, plans to expand oil palm cultivation to meet domestic demand and reduce palm oil imports from Malaysia and Indonesia. Oil palm monocultures are replacing mature tropical forests besides secondary forests resulting from shifting agriculture in North-East India. (Photo: T. R. Shankar Raman, CC-by-SA 4.0). Oil palm expansion in India is slated to occur within the country’s north-eastern region that falls within portions of two global biological diversity hotspots, the Himalaya and Indo-Burma. Other monoculture plantations established or expanding in these regions include timber plantations, notably teak Tectona grandis, and other plantation crops such as tea and rubber. Teak plantations in summer offer a dry and leafless prospect for rainforest birds. (Photo: T. R. Shankar Raman, CC-by-SA 4.0). Given the extraordinary diversity in north-east India, conservationists are justifiably concerned at plantation expansion. But forest loss is not the only issue. Also at stake is the loss of traditional multi-crop agricultural lands and practices. The forested mountains of North-East India are home to over a hundred indigenous tribes whose agricultural mainstay remains the practice of shifting cultivation, locally known as jhum. A traditional swidden system of organic farming, jhum involves rotational cultivation of cut and burnt fields, followed by a fallow period during which secondary forests are allowed to recover, before the next round of cultivation. Jhum creates a habitat mosaic of fields, fallows, and forests, including remnant mature forests in the landscape. 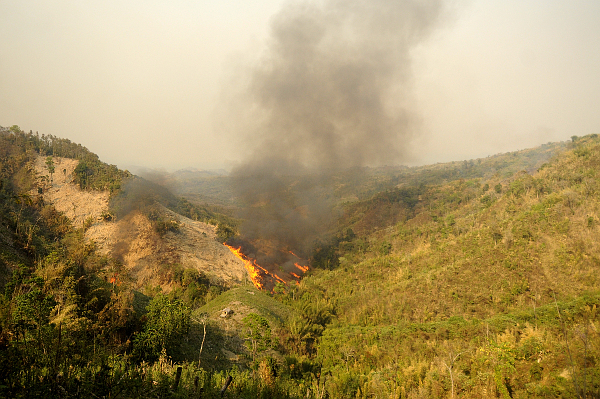 A current year’s jhum field is set alight in a landscape that includes the previous year’s fallow, regenerating bamboo and secondary forests, and remnant mature forests. (Photo: T. R. Shankar Raman, CC-by-SA 4.0). 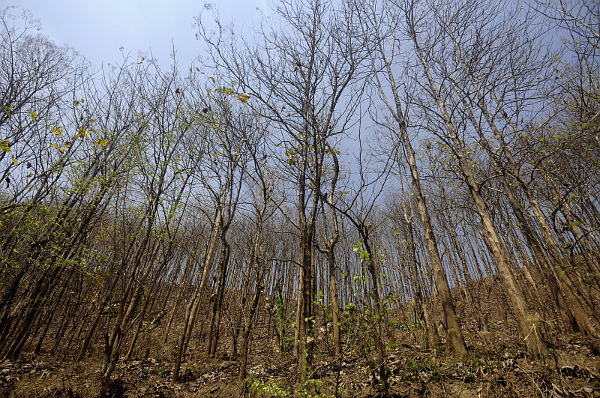 Yet, since colonial times, foresters have decried jhum as destructive. In recent years, government authorities in states like Mizoram are deploying policy-based incentives to eradicate jhum and replace it with other livelihoods and land uses, including oil palm. “…monoculture plantations …are superior in conservation value to successional habitats arising after jhum, especially bamboo and secondary forests, which harbor many forest bird species’’. To find answers, Jaydev Mandal, a research scholar at Gauhati University, and I surveyed sites in the core and buffer zones of Dampa Tiger Reserve, a 500 km² protected wildlife reserve in Mizoram state, North-East India. We selected five study strata: oil palm plantation, teak plantation, shifting cultivation (jhum), mature forest edge, and mature forest interior. In March and April 2014, we surveyed for birds along twenty transects (100 m long and 30 m wide on either side) within each of the five strata distributed across multiple sites, constrained by logistics. We surveyed oil palm areas planted since 2007 and 15 – 25 year old teak plantations established by the Forest Department near villages along the Tiger Reserve boundary. For shifting cultivation, we covered a range of sites representing the typical jhum landscape: recently burned fields, fallows, and secondary forests with bamboo that had regenerated for 7 – 8 years, the typical rotation period. We looked for birds in moderately disturbed, forest-edge transects abutting the reserve and in relatively undisturbed tall, closed-canopy rainforests in the reserve’s core. We recorded 107 bird species: 94 were birds of mature and secondary forests, 13 were open-country species of open and sparsely wooded habitats. In oil palm plantations, we found mainly five common and widespread open-country species such as Olive-backed Pipits and Spotted Doves on the ground and Red-vented Bulbul and Common Tailorbird in the few shrubs and trees. A mix of open-country and forest bird species occurred in teak and jhum sites, but the latter brimmed with birdlife from understorey babblers and flycatchers to canopy minivets and woodpeckers. 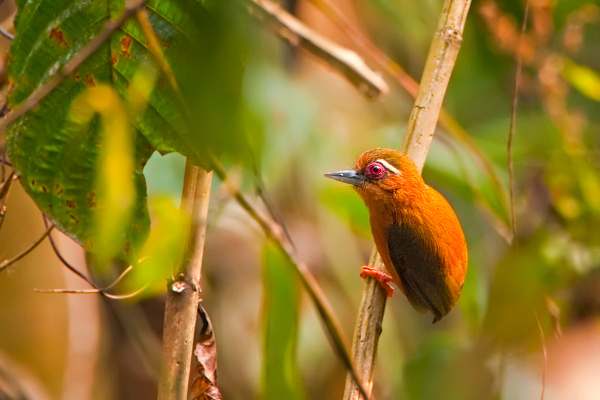 Some forest bird species such as Yellow-bellied Warbler, Brown-cheeked Fulvetta, and White-browed Piculet, occurred mostly in the jhum landscape and bamboo forests. Mature forest sites had few open-country birds and a large diversity of forest birds, including 25 species not seen in other habitat strata. These included birds such as Grey Peacock-Pheasant, Red-headed Trogon, Blue Pitta, Mountain Imperial-Pigeon, Long-tailed Broadbill, and Wreathed Hornbill. 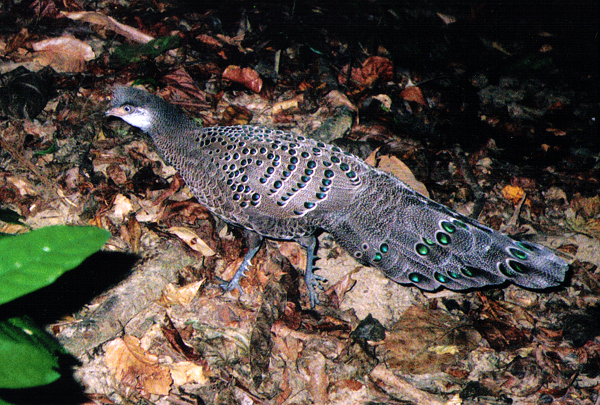 Grey Peacock-Pheasant Polyplectron bicalcaratum prefers mature and late secondary forests. 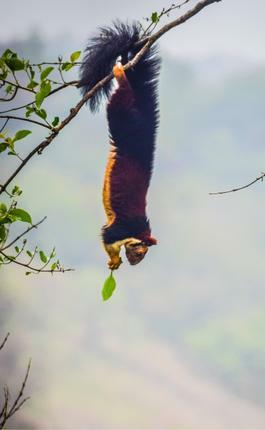 (Photo courtesy: Mizoram Forest Department). Quantitative analysis reinforced our impressions. Oil palm plantations had one-fifth the number of forest bird species recorded in jhum (10 vs. 50 species) and jhum was intermediate between teak plantations (38) and the rainforest interior (70). We also found that the jhum landscape supported more forest bird species, higher bird abundance, and a more similar mix of species relative to mature forests, than teak or oil palm. Our vegetation data suggested that this could be due to the rapid recovery of secondary successional forests, including dense Melocanna bamboos, in jhum sites. 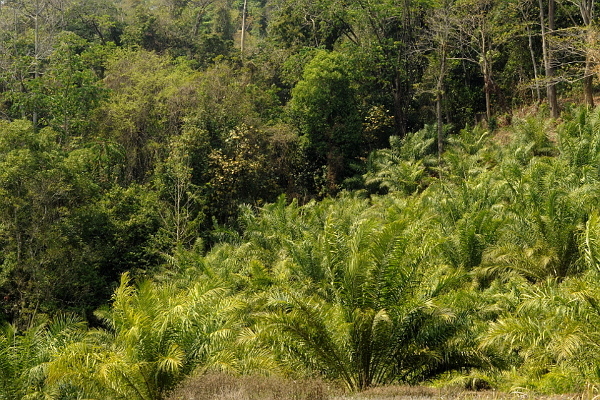 Oil palm and teak plantations had few native trees and little bamboo, and oil palm also had sparser canopy. 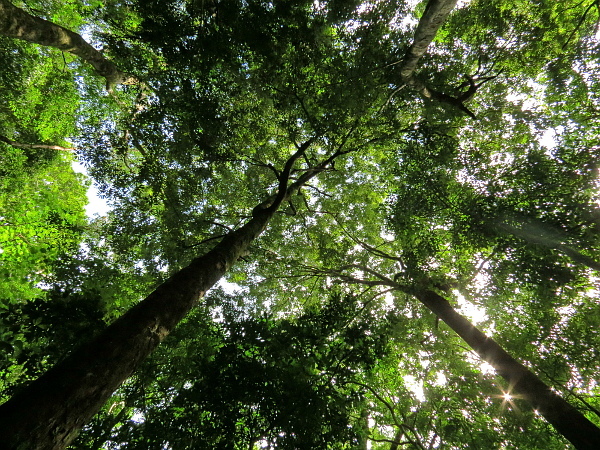 Our findings were broadly consistent with earlier research from South-East Asian tropical forests. 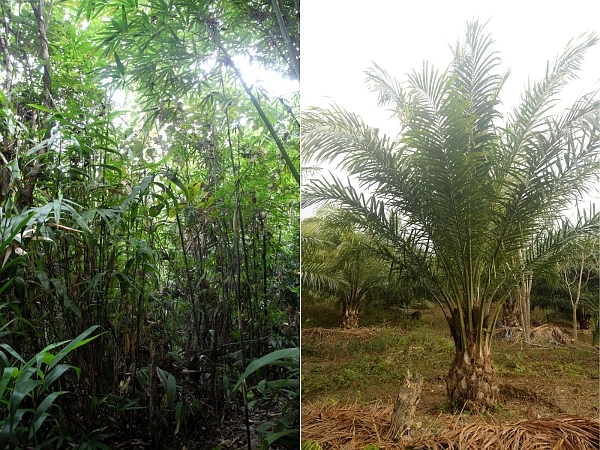 Dense vegetation characterises the interior of secondary forests recovering after jhum (left) unlike the open vegetation of oil palm (right). (Photo: T. R. Shankar Raman, CC-by-SA 4.0). Earlier research that had reported jhum as supporting fewer birds than mature rainforests had compared individual fallow sites that had regenerated for a fixed number of years (1 yr, 5 yr, etc.) with mature rainforest sites. Our recent research presents a better picture by comparing a range of sites representing the jhum landscape with a forested landscape. Although mature forest interior was still better for rainforest birds, an impressive array of forest birds persists in the jhum landscape. 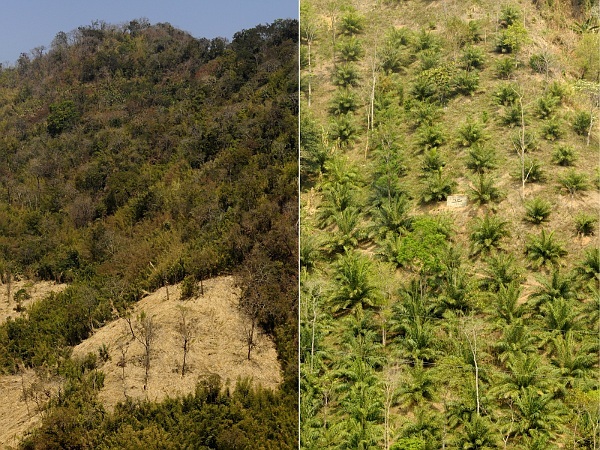 The jhum habitat mosaic of fields, fallows, and forests (left) supports more tropical forest birds than monocultures such as oil palm (right). (Photo: T. R. Shankar Raman, CC-by-SA 4.0). For forest and bird conservation, our results underscore the need to protect mature forests, but also attest that jhum cultivation is a better form of land use than oil palm or teak monocultures. Better land use planning and practices such as retention of forest remnants and areas of high conservation value amidst plantations are urgently needed to minimise the effects of ongoing conversion of forests and traditional shifting agriculture lands to oil palm monocultures. If we go blind to these needs under the meteor shower of neoliberalism and market forces, the tropics may well succumb to the march of the triffids. Azhar, B., N. Saadun, C. L. Puan, N. Kamarudin, N. Aziz, S. Nurhidayu, and J. Fischer 2015. Promoting landscape heterogeneity to improve the biodiversity benefits of certified palm oil production: Evidence from Peninsular Malaysia. Global Ecology and Conservation 3: 553–561. Dasgupta, S. 2014. India plans huge palm oil expansion, puts forests at risk. Mongabay. Koh, L. P. 2008. Can oil palm plantations be made more hospitable for forest butterflies and birds? Journal of Applied Ecology 45: 1002–1009. Raman, T. R. S. 2001. Effect of slash-and-burn shifting cultivation on rainforest birds in Mizoram, Northeast India. Conservation Biology 15: 685–698. Raman, T. R. S. 2014. Mizoram: Bamboozled by land use policy. The Hindu (op-ed), 14 May 2014, page 9. Raman, T. R. S., G. S. Rawat, and A. J. T. Johnsingh 1998. Recovery of tropical rainforest avifauna in relation to vegetation succession following shifting cultivation in Mizoram, north-east India. Journal of Applied Ecology 35: 214–231. Srinivasan, U. 2014. Oil palm expansion: Ecological threat to North-east India. Economic and Political Weekly 49. Great stuff, Sridhar. Had never heard of of this writer/novel – must read. Thanks Aparajita! It’s quite a story.